SAN FRANCISCO, CA--(Marketwired - May 18, 2016) - Summer visitors to millennial hotspots, college communities near popular urban centers, and fancy beach towns are choosing vacation rentals, like those listed on Airbnb, over hotels. In the process, they're often cutting their vacation costs significantly and gaining access to locales whose limited hotel inventory traditionally made visiting them impossible for many. That's the finding of the second annual analysis of summer hotel and vacation rental bookings, released today by Hipmunk, the travel search site with the most comprehensive range of travel choices. 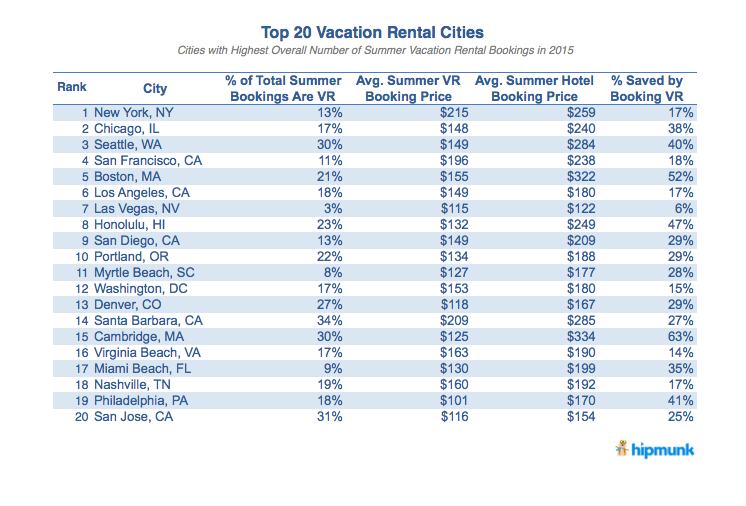 The analysis ranks 100 American towns and cities based on the percentage of overall accommodation bookings that were vacation rentals last summer (as opposed to hotels) along with the average amount travelers paid for both types of lodging in those cities. "In many places, vacation rentals save travelers money, but it's surprising to see just how big those savings are even in some very popular destinations," said Adam Goldstein, Hipmunk CEO. "Plus, in some places, there just aren't many or any hotels. Vacation rentals are making summer travel easier and more accessible to many more people." Techy urban areas popular with those under 35 experienced a boom in summertime vacation rental bookings, the study found, demonstrating that millennials continue to choose Airbnb-style rentals over hotels. Fifty-seven percent of all 2015 summertime lodging reservations in Boulder -- meaning vacation rentals and hotels combined -- came just from vacation rentals. Portland came in at 45 percent, San Jose at 31 percent, and Seattle at 30 percent. Nationwide, vacation rentals made up 16 percent of all summer lodging bookings. "When a high fraction of visitors to a given destination are young that translates into a big boost for rentals there," Goldstein said. Popular beach towns -- particularly those with limited hotel inventory -- also saw a surge in summertime vacation rentals, at times affording travelers significant savings over hotels and the opportunity to make short visits to towns whose traditional home rentals often require a week minimum stay. East Hampton -- a pricey beach enclave on Long Island popular among Manhattan elites -- ranked third when it came to the average vacation rental savings (vacation rentals averaged $327 vs. $765 for hotel rooms, a 57 percent savings). 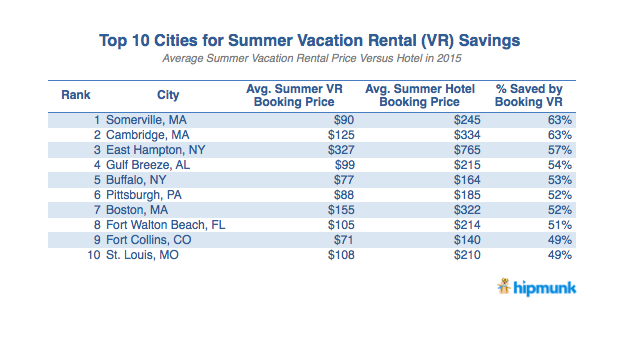 On average, U.S. vacation rentals cost summer travelers 11 percent less than hotels ($146 vs. $164). Ninety-seven percent of all East Hampton summer lodging bookings made through Hipmunk are vacation rentals, and 60 percent of those are for three days or fewer. Like East Hampton, Nantucket, Ma., and Montauk, Long Island -- popular beach destinations without a lot of hotel rooms -- also saw a disproportionately large percent of overall summertime lodging bookings coming from vacation rentals: both came in at 51 percent. Vacation rentals don't always mean savings, however. Nantucket's vacation rentals saved travelers just 16 percent over hotels ($324 versus $386) and Montauk a mere 6 percent ($413 versus $441). The two places that offered the nation's biggest savings to those booking vacation rentals were both college towns near Boston -- one of the most popular American vacation spots -- underscoring that vacation deals abound in college communities and locales on the outskirts of big cities. Rentals in Somerville, Ma., home of Tufts University, averaged just $90 versus $245 for hotels there (a 63 percent savings). Rentals in Cambridge, home to Harvard and MIT, came in at $125 versus the average hotel rate of $334, also 63 percent less, the biggest percent differential in the analysis. "When college students leave for the summer, there's a glut of empty off-campus housing," Goldstein said. "Short-term rentals there may be really cheap, which could save you a lot of money on your next trip." No matter the destination, travelers generally lock in summer vacation rentals earlier than they do hotels: 19 percent of summer rentals were booked prior to June 1 last year, compared to 14 percent of summer hotel stays. Travelers who want to book any type of summer accommodation, or make transportation arrangements, can use Hipmunk's A.I.-powered personal travel agent Hello Hipmunk. For more detail on the data from the study, please see attached tables. For a complete list of the most popular 100 US summer destinations -- including a break down between vacation rentals and hotels -- visit the Hipmunk blog at: www.hipmunk.com/tailwind/top-100-vacation-rental-cities-for-summer. Hipmunk is the fastest, easiest way to plan travel. The site and mobile apps help save time and money by comparing top travel sites to show the perfect flight or hotel at the lowest price. Hipmunk offers the most comprehensive travel search, from commercial flights, trains, and charter flights to hotels and vacation rentals through Airbnb. The unique display makes it easy to visually compare results to choose the best option. Try Hipmunk's new A.I. powered personal travel agent, Hello Hipmunk, to get instant planning and booking recommendations by sending an email to hello@hipmunk.com. Hipmunk analyzed its hotel and vacation rental bookings in U.S. cities that were made up to one year prior (June 1, 2014 - Aug 31, 2015) for a summer 2015 stay (checking in and checking out during June, July, or August).